I have been delighted by all things miniature for as long as I can remember and have always been very creative. When I put together my first dolls house kit I became hooked on the hobby and loved to make things to go inside my dolls house. So when I couldn’t find a doll I liked to live in the house, it seemed only natural to make one myself. I was so thrilled when I discovered polymer clay and soon made my first doll -- a strange looking baby whom I thought was absolutely beautiful! A self - taught artist I learned from my mistakes! Each doll was better than the last and soon friends were encouraging me to sell my little characters. I sold my first doll on Ebay and was thrilled at the response. Now I make 1/12th scale character dolls and one of a kind fantasy sculptures and fairies. Each doll is unique and created without moulds and I aim for as much realism as possible with very detailed features. I do take great care painting the dolls and the large expressive eyes have become my trademark. The clothing is hand sewn and I can create a doll from any period. I love to work from photographs to make portrait dolls. Most of the dolls are fully poseable, but I also create fully sculpted babies and fantasy dolls complete with settings. I am proud to be an Artisan member of I.G.M.A. and am also a member of the British Toymakers Guild. My dolls are available via my website, through Ebay , Etsy and fairs. I exhibit regularly at Miniatura, Scottish Miniatura, Kensington Festival and Pudsey fair in Leeds.. I am always happy to accept commissions. Just contact me to discuss your ideas for a doll and I can make them a reality. 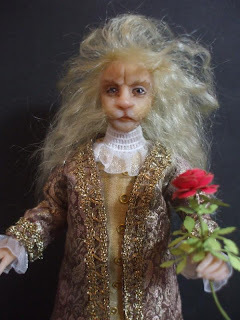 As the very proud owner of several of Julies beautiful dolls, all I can say is if you love quality, superbly made dolls for your miniature settings you then you MUST have some of Julie's dolls in your collections. I am always thrilled beyond words when I recieve them and they always get better and better, to the point where I am quite simply hooked on buying them, and have a wish list for Bella Belle dolls as long as my arm! !! Kate W.
Acabo de ver una muestra de tu trabajo y me ha encantado. Enhorabuena por conseguir desde cero algo tan bien hecho. Voy a tu web para ver mas. El resultado de tu esfuerzo es digno de destacar. Tus personajes son admirables y muy expresivos.